I've been looking for the perfect black suede high wedge platform shoe boots for a while now. I'd like them the shape of these gorgeous Giuseppe Zanotti ankle boots (originally £469 now down to £235) but I want them to stop below the ankle. 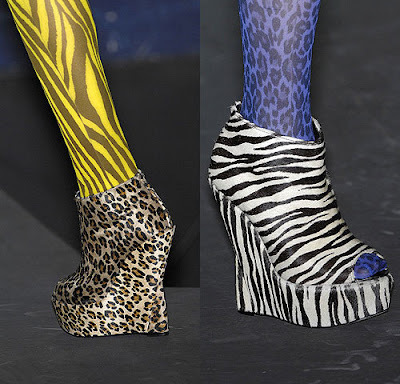 I've always liked simple, black or dark wedges - I love Ashish but these are for crazy people - and they're still going strong on the catwalks. Even higher up my never-gonna-get-it wishlist is this amazing Charlotte Olympia pair. Stocked at Browns they're an unfortunate £750 but as an investment wardrobe piece would make any outfit, as shown by the designer herself with her punk little sister Alice Dellal. Those Giuseppe Zanottis are gorgeous! Er, hello hotties! How dare Charlotte Olympia charge so much for boots. Bugger. Even if they were in a half price sale it would still be painful. How dare she indeed!